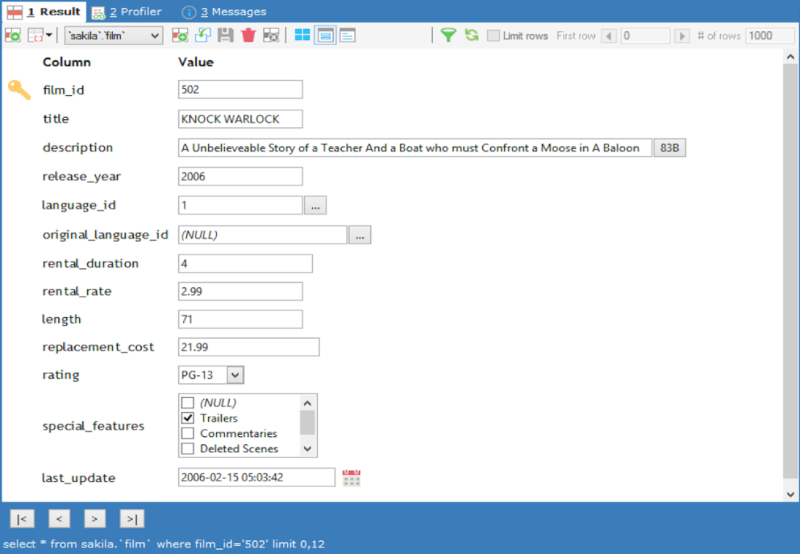 The form option displays the current record: with all the field names on the left and the corresponding values on the right. It is possible to view an entire row of data at once. Inserting a new row, updating an existing row, deleting and filtering are possible. The navigation options at the bottom of the form allow you to browse successive records as well as goto the very first and the very last record. The context menu (generated on right click in form mode) provides options to perform custom filter, set the cell value to Empty / Null / Default, Export Copy, Duplicate the current row, Delete selected row, Cancel and Save changes. You can enable the Form view by selecting the form option in the data tab. Toggle between Form Mode and Text Mode by pressing Ctrl+L.